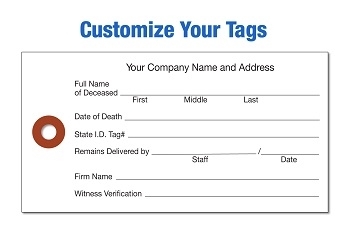 Create your own custom White Tyvek tags with your specific cremation process information. Pricing includes 1000 tags printed black ink one side, tags can be consecutively numbered or printed on other side for an additional charge, please call us at 1-888-278-0188 for details. Size #1- 1 3/8" x 2 3/4"
Size #2- 1 5/8" x 3 1/4"
Size #3- 1 7/8 " x 3 3/4"
Size #4- 2 1/8" x 4 1/4"
Size #5- 2 3/8" x 4 3/4"
Size #7- 2 7/8" x 5 3/4"